The Baseball Evangelist. He was born in Ames, Iowa, to a father who was a Union soldier and died a month after Billy's birth. Extreme poverty forced his mother to place him in an orphanage. While playing for a local baseball team, he was invited to play for the old Chicago Whitestockings later becoming the Cubs. A fast runner, he stole 95 bases in one season. His professional career found him also playing for teams in Pittsburgh and Philadelphia before converting to Christianity. Billy Sunday gave up his baseball career and began working for the Chicago YMCA while associated with an evangelist which led him to be ordained a Presbyterian minister. He began bringing a rural camp-meeting style to cities all over the country known as "walk the sawdust trail" for Jesus Christ. His mainstay subject was the evils of drink as well as condemning birth control, gambling, swearing and Sabbath-breaking. He was one of the first prominent preachers to make extensive use of the new medium radio. By the end of his career, Sunday had preached to over eighty million people. He participated in the prohibitionist movement and his influence was instrumental in getting the amendment passed. He wrote numerous books. He supported womens rights and attempted to reach out to American blacks. Sinclair Lewis' book, "Elmer Gantry" is based on his life, the book later made into a the movie. 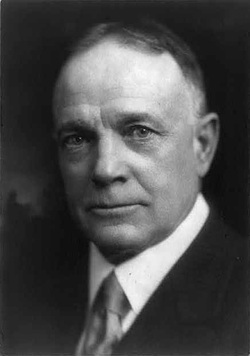 Billy Sunday was also immortalized in the song "Chicago," described as the town he could not shut down. Late in life having amassed a small fortune, he was able to move with his wife and four children to a lake front house at Winona Lake, Indiana which today is preserved and a favorite destination of tourist. Winona Lake was also home to The Lake Bible conference which staged many Chautaugua meetings featuring Billy Sunday. He continued to hold meetings until his death from a heart attack. His funeral was held at the auditorium of the Moody Memorial Church in Chicago, a facility where he appeared as a guest preacher many times. Thousands filed past his bier and 3,500 people attended the service officiated by Dr. Ironside, the pastor of the Church. Many remained outside unable to gain entrance. 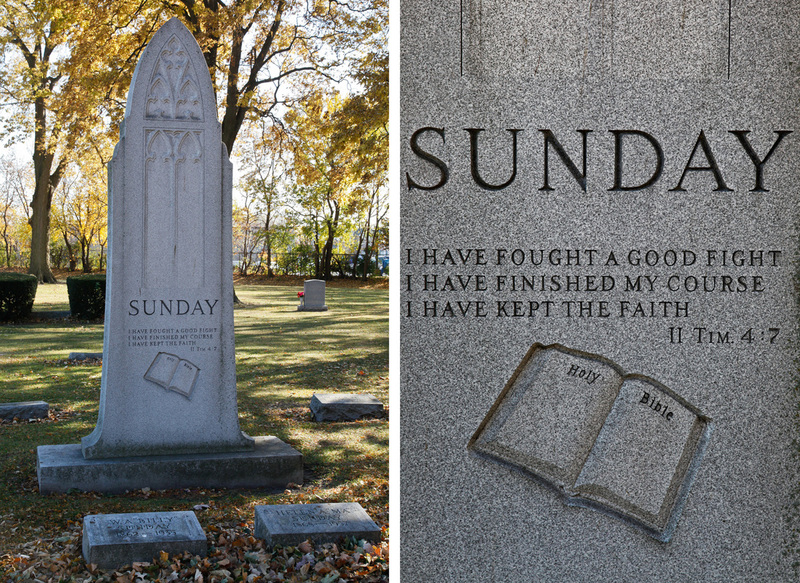 His marker in Forest Park bears a Bible verse inscription appropriate for a "squeaky clean" evangelist who practiced what he preached, "I have fought a good fight. I have kept the faith."